After spending ages trying to think of some way to structure this blog, it turns out I can’t because there are so many amazing experiences I want to share. So although this piece might skip here there and everywhere…I hope I can relay to you at least some of the excitement that I am feeling and experiencing on a daily basis. I guess I’ll start with yet another one of Japan’s amazing ideas…Karaoke. 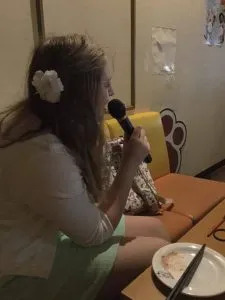 My host mother, sister and I all went to do Karaoke but what many might not know is that Japan does Karaoke like none other. We rented out a Karaoke booth for 3 hours (which really only felt like 20 minutes) and had unlimited ice cream and drinks from the drink bar. I’m not only talking your typical coke and fanta though, no you had several versions of each to choose from, along with peach juice, grape juice and all other kinds of juice that if it wasn’t for the fact that you were singing, you would probably make it through a good 10 refills. The Karaoke box not only had Japanese songs but it also had a huge variety of english songs to choose from, mostly whatever made the top of the charts but you’d be surprised on what you’d find (Celtic women and Enya were on there! ) We also had a machine to order food on so we were able to have our lunch (a delicious Yakisoba lunch at that) without moving anything but a finger. Afterwards I also did Purikura with my host sister which is like a photobooth that photoshops you and lets you design and customise your pictures afterwards. Although the pictures make me look like some kind of alien barbie it was still really fun and made it on the list of things Ireland is lacking! Another thing Japan is famous for is Onsen or in english, Hot Springs. We travelled outside Suwa to Azumino ( a place that came straight out of a Studio Ghibli film ) to go to a hot spring in the mountains. If you know anything about Onsen you know that foreigners can be reluctant to go because of the whole no clothes thing but when you get past that fact it is an absolutely amazing experience! I could only last about 10 minutes in total though because the heat was like something I had never felt before, but that said it was one of the most relaxing things I have done and definitely worth the embarrassment of turning the exact same colour as the pink hairdryer my host mother was using right after. Another place we left Suwa for was the beautiful city of Matsumoto, the home of the most beautiful piece of architecture and culture I have ever seen, Matsumoto Castle. I know I have overused this word in these blogs but there simply is no other way to describe it but magical. I was yet again transported into a fairytale land as we walked around both outside and inside the castle. 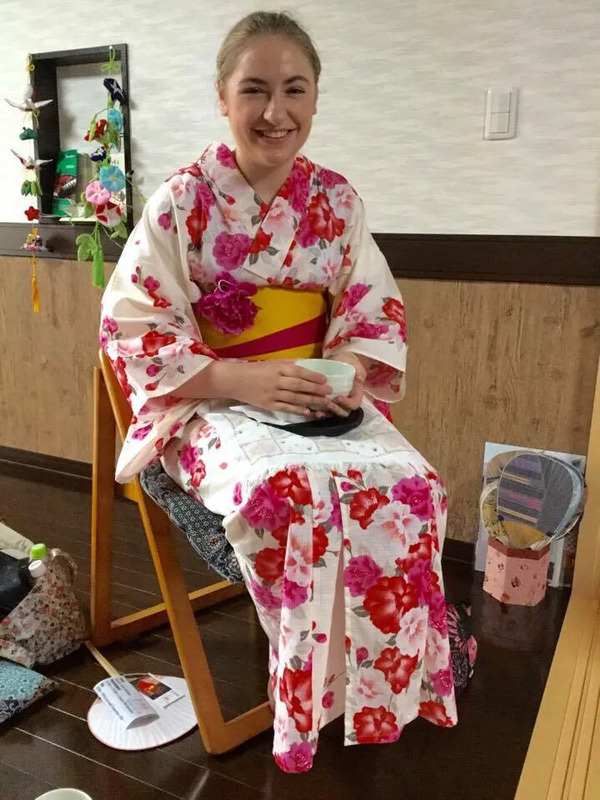 It was really hard to say goodbye to but I knew I had to as we headed for our next course of action…the Kimono rental shop! 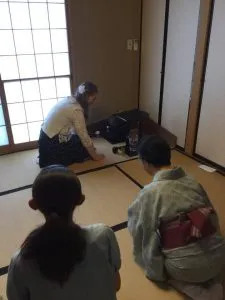 After making one of the toughest decisions in my life (choosing which yukata to wear XD ) I started to get dressed into the yukata…well I didn’t do it my self it took 2 women and 15 minutes before I was ready!! how did people do this everyday I still don’t know…and on top of that, despite the yukata being a lighter material for the summer, I still was internally melting in Matsumoto’s 33 degree heat! Nevertheless wearing a Yukata was an absolute dream come true. I was surprised each and every time I saw myself in a shop window until I realised I was actually getting the chance to wear one! After the tea ceremony, on our way back home we stopped at a site of the onbashira festival that is held in Suwa every 6 years (known as the most dangerous festival in Japan where men ride huge logs down hills) The view from the top of the hill was so spectacular that it had us all, my host family included, stood at the top for a good 30 minutes before we got back down. I was in paradise once again! That’s it for today! I just got back from Tokyo so there will be a whole other blog on that on its way, and let me tell you it was like living out a lifetime of fun in one day! My arrival in Chiang Mai and introductions to MPlus+!